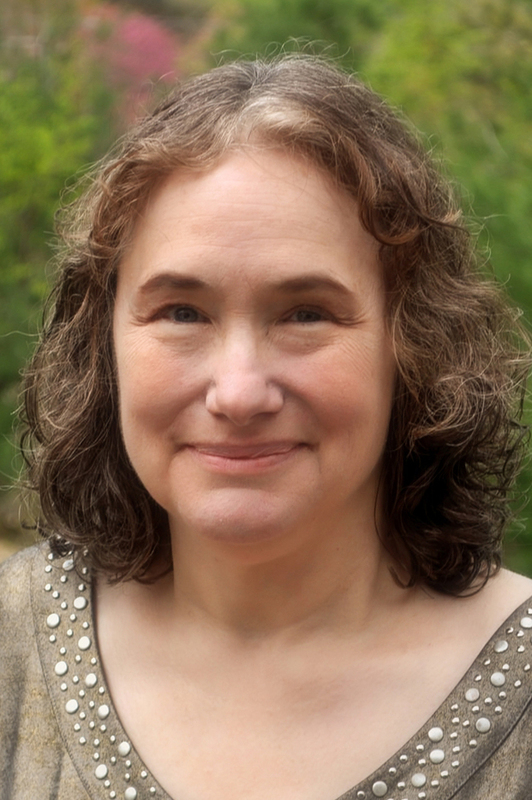 A life-long lover of Jane Austen’s novels, Abigail began writing variations on Pride & Prejudice in 2001, then expanded her repertoire to include a series of novels set on her beloved Cape Cod.Her most recent releases are Conceit & Concealment, the national bestsellers Alone with Mr. Darcy and Mr. Darcy’s Noble Connections, and Mr. Darcy's Journey. Her books have been translated into five languages. A lifetime member of JASNA, she lives on Cape Cod with her husband, her son and a menagerie of animals. Her hobbies do not include sleeping or cleaning her house. By all accounts, this 'Pride & Prejudice' variation is an angsty read. If you've read 'The Last Man in the World' or Abigail's modern P&P-inspired read, 'The Man Who Loved Pride & Prejudice' you'll know that she's no stranger to writing angst, and this is what she is writing about in her guest post for us today. I recently received a text from my daughter: "I hate you. How dare you. This is ridiculous. You had better fix this." Uh-oh. What had I managed to do wrong from a thousand miles away? Then I realized the problem: she was reading Conceit & Concealment, my new Pride & Prejudice variation, and she’d reached the Black Moment. My plot structure had succeeded! The Black Moment is the key to a successful story. It’s what turns a romance plot from being a long series of misunderstandings into a memorable story that you can’t put down and that leaves you with that feeling of satisfaction at the end. It’s that dizzying moment in the plot where all hope seems to be lost. The Black Moment should happen just when everything seems to be coming together, when the conflict between the characters is resolving and the end is in sight. And then, boom – a disaster, the true test. In Pride & Prejudice, it’s Lydia’s elopement, ruining Elizabeth’s hopes of ever making a good marriage just when she and Darcy seemed to be nearing an understanding. The Black Moment can’t be just a misunderstanding, something the reader knows can be resolved if the characters just sit down and talk to each other. It has to feel truly hopeless. It can be challenging to come up with credible problems like that in romances or JAFF without resorting to external problems like kidnapping, floods, or plague, but that risks crossing the boundary into melodrama. I’ve been thinking about the importance of the Black Moment because I had problems with it in Conceit & Concealment. I’m a pantster, a writer who plots by the seat of my pants, as opposed a plotster who diagrams it all out in advance. This isn’t a matter of choice on my part; it’s because my characters always make a hash of whatever plot plans I have, so I’ve given up planning. But the problem with being a pantster is that you can end up meandering, and then you have to figure out where you went wrong. That’s what happened in my first draft: I got stuck in a meandering dead end. I had sent all my main characters off on a trip to Wales – journeys are usually a good thing to raise the plot stakes and increase reader involvement – and nothing was happening. The scenes were pleasant, the characters were likeable, their relationship was developing – and it was bland and unmemorable. Once I realized I was stuck, I started looking at the plot structure. Yes, I’d made a beginner’s error and forgotten to include a Black Moment! It was especially embarrassing as the scenario had enormous potential for Black Moments. Although primarily a Darcy and Elizabeth story, Conceit & Concealment takes place against an alternate history background where Napoleon had conquered England several years earlier. There’s nothing like an army of occupation to get in the way of a blooming romance, especially one where the head of police considers almost everything to be a hanging offense. No need to resort to mere gossip or social manipulation for a Black Moment in this plot! So I came up with a doozy of a Black Moment. I hauled the characters out of their interminable trip to Wales, stuck in my Black Moment, and the remainder of the plot fell into place like magic. And my daughter isn’t speaking to me. Oh, well. You can’t have everything! 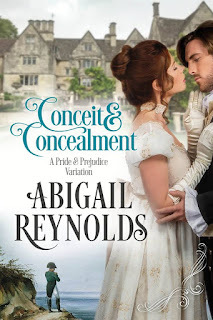 Abigail is kindly offering to give away e-books of 'Conceit & Concealment' to two of you lovely people. To enter, all you need do is leave a comment on this blog post, either about angst, or how you feel about this premise, of a French-occupied England. It's a real departure from canon. Leave your comment by the end of the day on Sunday 11 June 2017, and please, leave a way for me to contact you in case you're the lucky winner. This is open to international entrants. Thank you so much to Abigail Reynolds for both the guest post and the giveaway! If you can't wait for a giveaway and need to read the book sooner it's available to buy now - on Amazon US, Amazon UK and very likely other Amazon sites too :) You can also add the book on Goodreads. This sounds like a wonderful story,peppered worn romance,intrigue and just enough angst to make the reader question what this Black Moment is and how it is to be surmounted and resolved to everyone's relief and satisfaction!!! So exciting!!! I followed this story online and must admit that I'm really looking forward to reading it. Glad to hear you read the early chapters on Austen Variations. I hope you enjoy the remainder! Am heartened to read that Abigail is a pantster and that her characters,those we hold dear,oft times misbehave and take her story off on a tangent,thus ensuring they encounter unforeseen mischief and mayhem!! Best of luck with this book,Abigail! I think it's always interesting to find out things like this about the writing process because people seem to differ so much in their approach. This story must be good if your daughter hates the crucial moment! It's already on my must-read list, so I wouldn't mind winning a copy. Many thanks for the review and giveaway. Thanks for putting it on your list! Me too Becky. When I was new to the genre and discovering new authors Abigail was one of the first who stood out as a must-read author. I'm afraid she did mean it! Agreed Kate, I am an angst-weenie but I think Abigail does angst so well that even I can enjoy it! It was such a fun premise to write! Everything else now feels tame in comparison. I love the premise too, Darcybennett, it's a real departure from canon. I hope you do enjoy it despite the angst. I personally don't like it when a book is constant angst; I like to be able to resolve it pretty quickly. I am not a lover of too much angst either Glynis, but if the balance is right it definitely adds to the excitement of a story. Thanks for commenting and good luck in the giveaway. I like the idea of an alternate history in any book so I am looking forward to this - as Britain is occupied by the French does that mean the Colonel will be in the story? 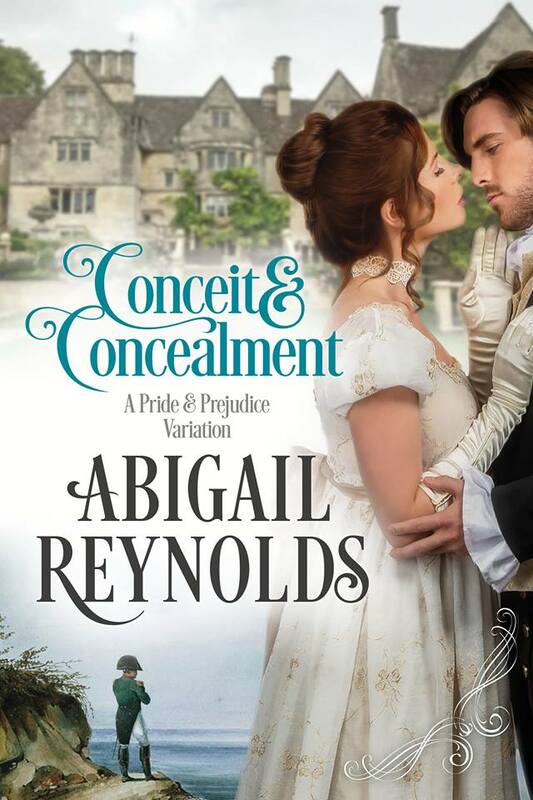 I have loved everything written by Abigail Reynolds and I am currently reading Conceit and Concealment, so please don't pick my name. But, had to just add my two cents in honor of probably the first JAFF author I ever read and the one who still causes my pulse to race. Thank you! Thanks! So glad you've enjoyed my books. Thanks, Regina! There are lots of great online articles about Black Moments, too. Glad you've enjoyed Abigail's books, Regina. I hope you enjoy C&C just as much as the others. I can't even imagine a French -occupied England in that time period. Wow--takes a creative writer. Beautiful cover, too. Thanks! It was a fun concept to work with. Like Regina, I hadn't come across the term "Black Moment" before, but totally "get it" now! It was due to stumbling upon Abigail's blog in early 2014 that I discovered the newly formed Austen Variations site and the wonderful wide world of JAFF and the online community, including your blog, Ceri. I'd dabbled a little with a few audiobooks in previous years but had "no idea" what else was out there! So I'll always be grateful to Abigail for being my gateway into the JAFF-o-sphere. I've got all of her published books, except this one, as ebooks or audio or both, so a win here would complete my collection nicely. I love the idea of an alternative JAFF reality as we have here in Conceit and Concealment and followed the early chapters as they were posted online. It reminds me a little of a TV drama that was broadcast here in the UK earlier this year. Don't know if any of my UK friends saw it - SSGB, where the Nazis had successfully invaded the UK during WWII There's even a JAFF connection there. The lead was played by Sam Riley - Darcy from Pride and Prejudice and Zombies! Hope Abigail's daughter forgives her soon! Anji, I read about SSGB, but we couldn't see it in the US. It did sound similar - albeit without Darcy and Elizabeth! But I'm so glad you discovered the JAFF world. It wouldn't be the same without you! Aww, thanks Abigail. Because of one particular scene in the early chapters, I'll always think of you and this book whenever I ser a bluebell wood! It's been a good year for them this year. The TV programme sounds very interesting, like the type of thing I'd enjoy. I am so bad at watching TV though, I very rarely watch series, I have the perception that I won't have time to commit so I usually watch stand alone type shows! Hi Daniela, I hope you enjoy C&C too when you read it. Good luck in the giveaway! I had never heard of the concept 'black moment' but it makes so much sense. OMG!! Light bulb!!! I'm throwing my name in the pile for this give-a-way. I can't wait to read it. I learned about the black moment after I'd already published several books, and it was definitely a light bulb. It's the difference between books I've been really satisfied with and ones I'm not. I'm glad you enjoyed the post Jeanne! Good luck in the giveaway. This sounds like such an interesting premise! I love stories set during war. Would love to read the book. Thanks for the giveaway! It's something different isn't it Priscilla. Thanks for commenting and good luck! Thanks, Jen! So glad you enjoyed it. I followed the chapters posted online and have now read the story as a published e-book. I found Abigail's stories long before I found the JAFF community. I believe it was when she had a link to some sales by a number of authors that my JAFF world expanded exponentially. I have read all her books, some with the original covers, and mostly in paperback form. And I have reread some in whole or in part. She never disappoints. Thanks for sharing here. Thanks, Sheila. I'm glad I could help you discover the greater JAFF world. That's fantastic, Sheila, Abigail opened the JAFF door for you too. WOW I can hardly wait to read this one! I remember Abigail's post from her daughter...OH BOY I cannot wait! Me too, Leah! It was seeing Abigail's facebook posts about the message from her daughter that suggested the idea of a post on angst. I'm glad this post whipped up your anticipation to read this one! I already bought the book, so please don't enter my name in your drawing. While I haven't had time to read it yet, I hope to within the next week or so. I'm really looking forward to it! I hope you enjoy the book when you have time to read it Katherine! Truth to be told, when I first read about Abigail's new book plot, I was a little bit apprehensive of whether or not such alternative universe variation would be to my liking (I am too conservative sometimes). Thank you very much for new intriguing book, for this interesting post (I learnt to differentiate a pantster from a plotster:))) and for generous giveaway! I know what you mean, oloore, sometimes if things veer too far from canon you can feel like it's not really a P&P variation, but I think if the author can make the characters true to Austen's characters there can be a lot of enjoyment in seeing them in unfamiliar circumstances and I think Abigail is good at presenting my idea of Austen's characters, so I'm keen to see them in an alternate Britain. Good luck in the giveaway! I, too, never heard about the 'black moment' and it certainly is! The premise of this story is certainly very unique and I look forward to reading it! Thank you for a chance at the giveaway! I am very intrigued about the 'black moment', Carole! Thanks for commenting and good luck in the giveaway. I've been enjoying the excerpts online, and this alternative timeline makes for a really different variation. Thanks for the giveaway. I love the idea of such a huge change to the environment Miriam. I hope you enjoy the book when you read it, and good luck in the giveaway! This variation sounds like it is very different from the original! I loved reading about the thought process behind the final product. I love getting an insight into the writing process too, NovElla. Thanks for commenting and good luck. Having followed the early chapters online, this is definitely a must read. 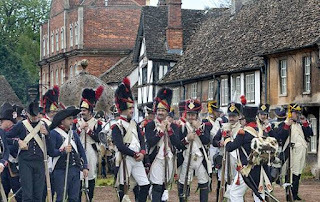 I'm burning up with curiosity about what the "black moment" could possibly be -- the French occupying England is bad enough, with the threat hanging over the ladies of Meryton adding greatly to the angst. This promises to be a very original variation that will be impossible to put down. Please enter me into the giveaway. Will do, Flo! I can't think what the moment could be! I could not imagine history changed so drastically so luckily it's just a story and not real at all. If not French would be the internationally recognised language instead of English. That said, I feel like the plot is interesting and would love to read this angsty novel.